In western countries, the average person eats their own weight in meat every year, which means that livestock rearing makes a significant contribution to greenhouse gas emissions. This is partly because ruminant animals like cows release methane which is produced by the bacteria growing in their digestive tracts. Jamie - The challenge we have is, as everybody knows, there is going to be 9 billion people by 2050, and we've got to find ways of feeding them. In many levels, that will be with better crop production, but we also have to remember that a lot of the land in this world is only suitable for growing grass. So, in the UK for instance, about 60% of our land is grassland. On the global level, it's maybe about 35-37%. So we've got to find ways of converting that into human edible food. Of course the way to do that is to use herbivores and particularly ruminants - cattle, sheep, goats - to convert things that aren't edible into things that are edible by in the form of meat and milk. Chris - Good news for people who like meat like me, less good news for vegetarians perhaps, but what is the downside of doing that because it sounds like there's plenty of land, we just have more cows and sheep, and goats? Jamie - I don't think I'm necessarily talking about more sheep and goats. We're talking about restructuring so that we don't compete with humans for human edible feed. When you feed cattle things that you and I can eat, they're relatively inefficient. Less than 65% of the energy transfers into the meat. However, when we feed cattle grass, things that we can't eat, the actual increase in the human edible protein is about 700%. So it's changing the way we use ruminant livestock. So they use food that we can't. Now the challenges in doing that are to make sure it's efficient and to make sure we minimise the environmental damage associated with cattle and sheep. Chris - There are two challenges there. Let's take the first one first - the efficiency. From what you've just said though, it sounds like ruminant animals are already extremely efficient, so how can we improve on that? Jamie - Ruminants have a fascinating environment. Take the dairy cow for instance. You've got a rumen there that's about 100 metres big. About the size of a domestic dust bin, full of microbes, all actively degrading the food. What we need to do is make sure that that degradation is the most efficient so that we get the best transfer of the nutrients that are in the grass through the microbes and then into the animal. Chris - And in order to make that process more efficient, we've got to tweak the microbes. Jamie - Or we can tweak the forage. So what our own researchers do is try to understand how the microbes interact with the forage so that we can advice farmers on planting the right grass that then is fermenting the most efficiently in the rumen. And ultimately, trying to balance the forage with the microbes and of course, with the host because the other thing we know is that the animal itself has a large degree of control on the microbial population in the gut. Chris - This is the sort of a pre-biotic effect, isn't it? It's in the same way that people will say, "If you eat a lot of porridge, you have beta-glucans in your diet and this promotes the growth of healthy or so-called 'good bacteria' in your intestine." You're talking about a similar sort of thing with what you feed into your ruminant animals. Jamie - It's a very similar concept. It's about maximising the output and of course, as I said before, minimising the environmental issues. Chris - Well since you've raised that, what about the fact that the microbes in cows at the moment are extremely bad for the world because they pump out huge amounts of methane? Can we do anything about that? Jamie - Well, I think we can. I think it's probably the first point to make. It's important to remember that it's this microbial population that produces methane and we can do a lot to reduce that. So for instance, we have worked using new grass varieties, that when we feed them to the animals, the animals grow quicker and we have 25% less methane. 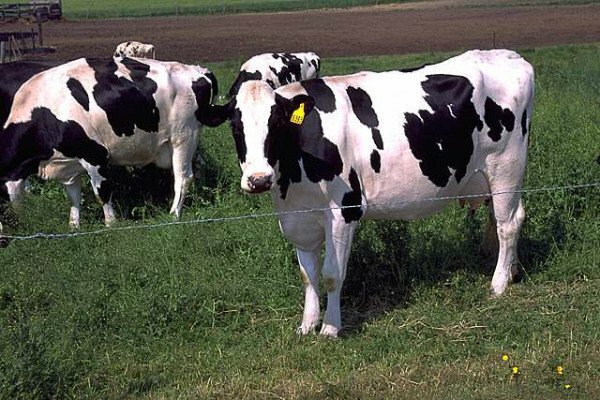 Colleagues in New Zealand are working on vaccines that you can vaccinate the animal with to destroy the methanogenic archaea in the rumen, and the animal produces less methane. And then most excitingly of all, there seems to be now good evidence that methane production by ruminants is actually a heritable trait and just in the same way that we breed for high milk production, we can probably breed for the animals that produce less methane. So I think we have nutritional, we have vaccination, and now, we have genetic methods. Chris - Just to return to the point you were making about getting rid of the methanogens, the bacteria that make the methane in the guts of the animals, is one not necessary to have the other? In the sense that it's interesting how this is such a ubiquitous trait in these animals, they produce huge amounts of methane. Is it not necessary for them to grow as efficiently as they do to taste as tasty as they do when you send them to the abattoir and then turn them into a burger? Are we not going to end up, if we lose those microbes with a less efficient animal in the long run? Jamie - Now you may have thought that would be so, but there have been proof of concept studies done where we have used chloroform and chloroform is a direct analogue of methane. And although chloroform clearly is not a practical feed additive, when you add chloroform to the rumen, you switch off methane production and I, and others, also done trials now showing that when you do that, you can raise methane-free animals and they grow perfectly well, and the products you get out are the same. So, surprisingly, it seems this is an avoidable problem. Chris - Well let's put some numbers on this then. So, what sort of impact do you think that this sort of work could have on the amount of energy that we can supply the human race with? Are we looking at a food sustainability problem if we implement this? And also, what about the environmental impact? What sort of a dent in methane and therefore, indirectly carbon equivalents, can we make with this? Jamie - Okay, so to try and bring that out, food security, let's be clear, this is only part of the problem. We need, as everybody knows, to reduce the amount of red meat that rich western diets contain. So, I'm not advocating a high meat diet. I'm advocating red meat as part of a balanced diet. So it's only part of the solution to the problem of food security. Environmentally, just to give you some ballpark figures, the average daily cow produces about 30 litres of methane for every kg of dry matter it eats. Our estimates suggest that if we could get farmers to manage their animals better, then if the worst farmers farmed as well with the middle farmers, we might have a 15 to 20% reduction. If everybody farmed as well with the best farmers, there might be another 10%. So there's a lot we can do just by advising farmers. In terms of additives, there's no magic bullet on the horizon but there are certainly plenty of solutions that will make further reductions in the region of 20 to 25%. So, we can make a real difference to the impact of the greenhouse gasses from ruminants. How can we get power from poo?